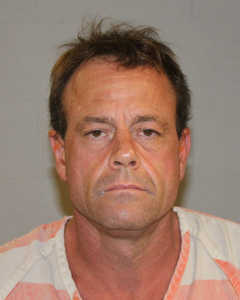 ST. GEORGE — A St. George man was arrested for stalking and trespassing Sunday after allegedly circling a woman’s home for an hour before adjusting one of her patio chairs in order to sit down and watch her through her glass backdoor. Police responded to a woman’s residence in St. George on a stalking report, according to a probable cause statement written by St. George Police Officer Jace Hutchings in support of the arrest. When Hutchings arrived the woman quietly opened the door and had him come inside her home. The woman pointed Hutchings towards her back patio where a man was sitting without a shirt on one of the woman’s patio chairs, the statement said. Hutchings ran out the front door and detained the man, later identified as 44-year-old Ben Lee Barton, on the side of the woman’s home. After interviewing the woman, who “appeared very frightened and terrified,” police learned Barton had been stalking her for an hour prior to police arrival, according to the statement. The woman told police Barton had been circling her residence and walked onto her property on four separate occasions, the statement said. Barton reportedly looked through the woman’s window before sitting down on her patio chair two separate times. When police interviewed Barton about the incident, he told them he “was confused and dazed thus causing him to sit on (the woman’s) patio chair,” according to the statement. Barton told police he suffers from a mental illness and needed to refill his prescriptions, and blamed his mental illness for his actions, Hutchings said. Barton was arrested and booked into the Washington County Purgatory Correctional Facility. He was charged with a class A misdemeanor for stalking, and a class B misdemeanor for trespassing. Barton was released from custody on $2,630 bail, and his arraignment is scheduled for June 1. Medicated or not, the guy is still a creepy nutter and belongs in jail. This should be a warning to the rest of you CREEPERS out there that throw rocks, pinecones, gardner’s gloves, tennis balls, yup you know who you are! You are next!!! Sounds like you have some little terrorists harassing you. Let me add to that…..that would be at the WINDOWS!!! I know who you are and I will catch you 4 the last time!!! /mental note to self: Don’t ever adjust patio chairs. The woman appeared “terrified and frightened”? She was laying on the couch and had apparently been watching this unroll for an hour and only called the police when he moved the patio chair “closer to the house”? What’s wrong with this picture?